When a neuron fires, it sends an electrical impulse down the length of the axon to the axon terminals. Excitatory neurotransmitters make it easier for the post-synaptic neurons to fire; inhibitory neurotransmitters make it more difficult. Each cell receives excitatory and inhibitory inputs from many synapses. When the sum total of these inputs reaches a certain threshold, the neuron fires, sending an electrical impulse down the axon. This firing is known as an action potential. When the action potential reaches the bottom of the axon, the axon terminals release their own neurotransmitters, stimulating (or inhibiting) action potentials in the next group of neurons. In this way, wide networks of neurons communicate with each other in very little time. Action potentials commonly travel at speeds of 50 meters per second and can occur every five-hundredth of a millisecond. Axons are coated by a fatty sheath known as myelin that speeds up the rate that the action potential travels down the axon. Because myelinated axons are white in appearance, brain tissue made up of these fibers is called white matter. In contrast, grey matter refers to brain tissue made up of dendrites and cell bodies (as well as glial cells and capillaries). The surface of the cortex is composed of grey matter. This graphic illustrates both the pre- and post-synaptic neurons and the synaptic cleft between them. 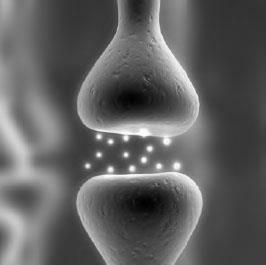 The bright dots are neurotransmitters that have been released into the synaptic cleft (iStock).